This is the William Paley argument from irreducible complexity — complexity cannot arise without the intervention of a creator — confronted at some length by Richard Dawkins in The Blind Watchmaker, where he uses the example of the mammalian eye to show how complexity can evolve. Then there’s language. How could such a complex system evolve? The literature on the subject is gigantic, but pretty much everyone argues that the complexity evolved from something simpler, a view opposed to creation stories in many traditions. In the Biblical tradition, for instance, there’s the Adamic language, spoken by Adam and Eve in the Garden of Eden: the language used by God to address Adam, the language used by Eve to address the Serpent, the language used by Adam in naming the creatures created by God. This was either given by God or invented by Adam, and there’s some tradition for saying it was Hebrew. But there was just one, and it first appeared in all its complexity — though the notion of complexity involved here is not very impressive, because of the tendency to see a language as just a big bag of words (like a big pile of monkeys). 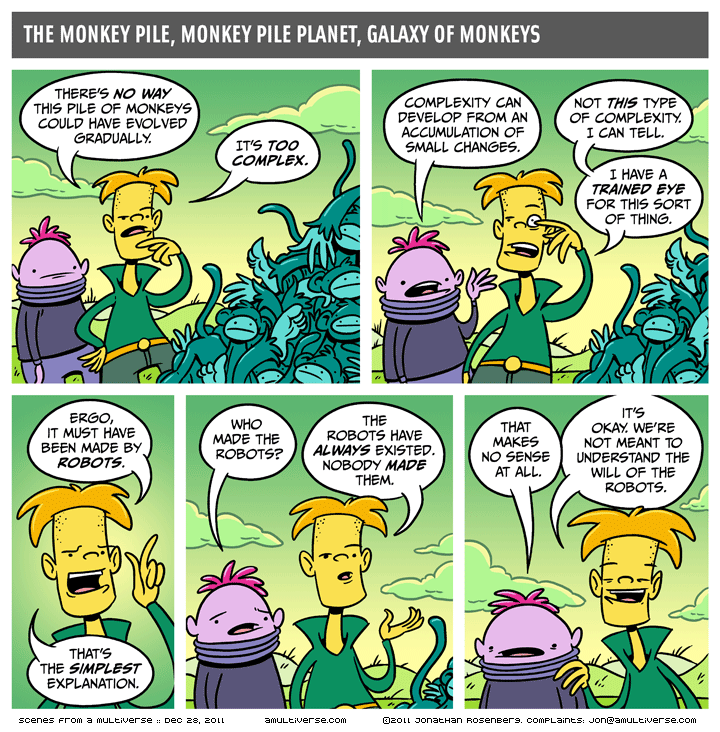 This entry was posted on December 29, 2011 at 9:40 am and is filed under Linguistics in the comics. You can follow any responses to this entry through the RSS 2.0 feed. You can leave a response, or trackback from your own site. Arnold, I love your blog! Any chance you could link back to the SFAM site instead of your local image so folks can get context and read more if they’d like? Thanks!